For data wonks like me, the annual Yearbooks from various gold and silver consultancies make for fun reading. You can always find little gems about what’s going on in the markets, and sometimes you can spot changes in trends early on. Seeing a compelling chart, especially one that’s not been widely reported, is almost as exciting as seeing my wife in a short skirt on date night. Well, I’ve got a series of charts for you that point to a silver trend that is so entrenched in its development, so inevitable in its outcome, so inescapable in its consequences that it comes as close as one can get to a guarantee. And once fully underway, it will have major implications for the silver price, along with the availability of investment metal. These charts all come courtesy of CPM Group’s 2018 Silver Yearbook. There are a number of precious metals consultancies in the industry, but I’ve found over the years that their Yearbooks have the most comprehensive and in-depth research (I know many readers disagree with their views on manipulation of the metals, but separate that out from the data they’ve uncovered and what it means). Isn’t Silver Investment Demand Down? What most investors hear is that silver demand is down. And yes, coin and bar sales fell 52% last year, ending up at approximately the same level as 2007. 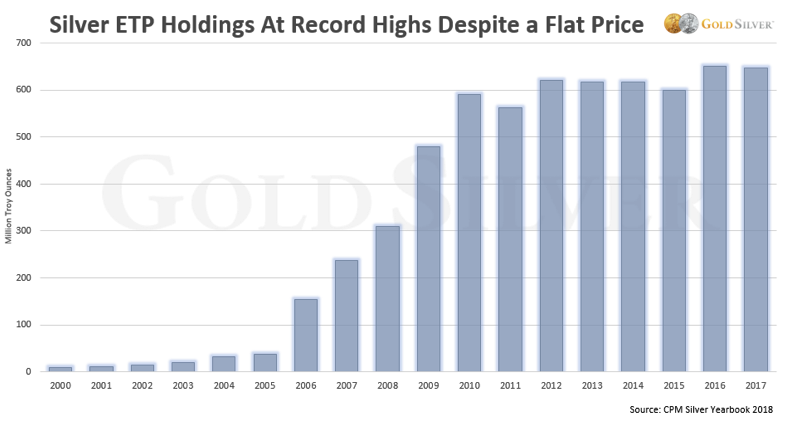 But demand for ETPs (exchange-traded products, including ETFs) remained near all-time highs, as the data shows. SLV and other silver paper vehicles saw virtually no drop in holdings last year, in spite of a weak silver price and falling physical demand. You and I don’t buy these products, but interest from mainstream investors has not let up at all. Fabricated product refers to anything a refiner forms from raw silver into a usable application or commercial product. So it includes almost all forms of silver, from medical applications and solar paste to jewelry, silverware, coins and bars. And the demand for fabricated silver isn’t letting up. 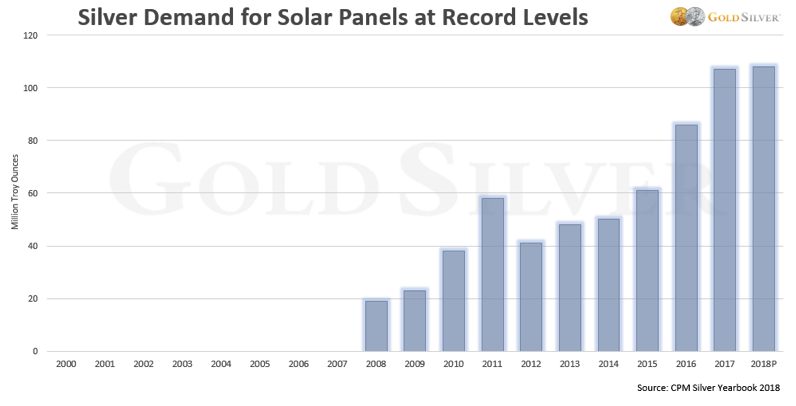 One of the biggest growth areas for silver demand has been photovoltaic use. Analysts predicted that solar power demand would fall last year. They were wrong. 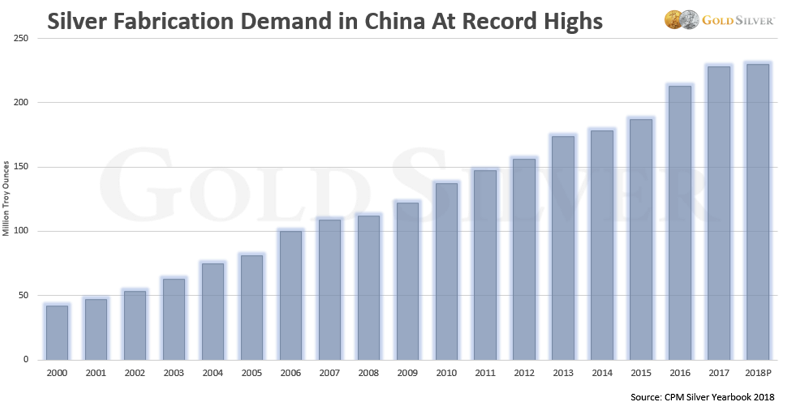 You can’t talk about precious metals without looking at China. Most recent reports cite “softening” silver demand there, but again that’s not what the data says. Year after year the appetite for fabricated silver products in the world’s largest economy continues to grow stronger. Since just 2015, fabrication demand in China is up 22%. You can see there’s been no “down” year in silver demand since the turn of the century. That won’t change anytime soon. Silver scrap is primarily comprised of recycled metal from jewelry and electronics. It is often overlooked by investors, but it amounts to roughly a fifth of all supply sources. And it’s not helping matters. Recycled scrap metal supply has fallen a stunning 41% from its 2012 peak. Yes, it will rise again when the price does, but that rise will have to be both substantial and sustainable before it’ll help overall supply in any meaningful way. Total supply peaked at 1.01 billion ounces in 2014, and has been in a declining trend since. Total market economy mine supply declined to 775.4 million ounces in 2017, down 26.5 million ounces, or 3.3%, from 2016 levels. Last year was the first year that mine supply joined scrap supply in driving total supply lower. It is no longer a “prediction” that fewer ounces of silver will be dug up by the mining industry. It’s already happening. And it will continue for the next decade. Mine supply is in a decade-long decline. 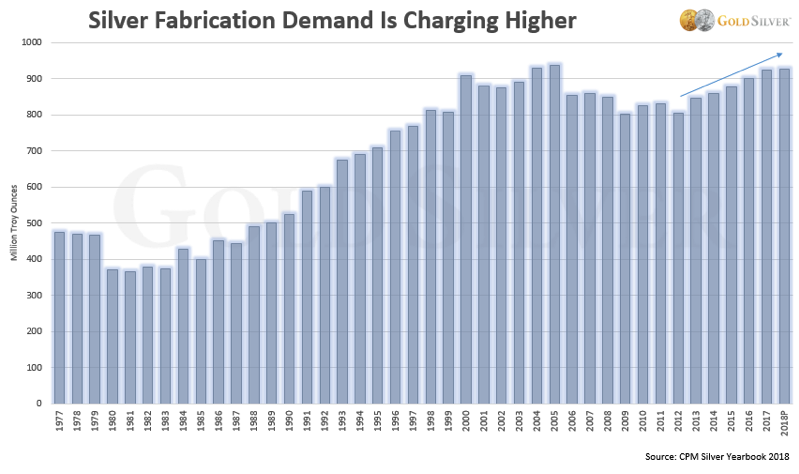 Fabrication demand is rising globally. These facts are irrefutable. If an analyst says differently, they probably hate precious metals. That’s okay, let them learn the hard way. 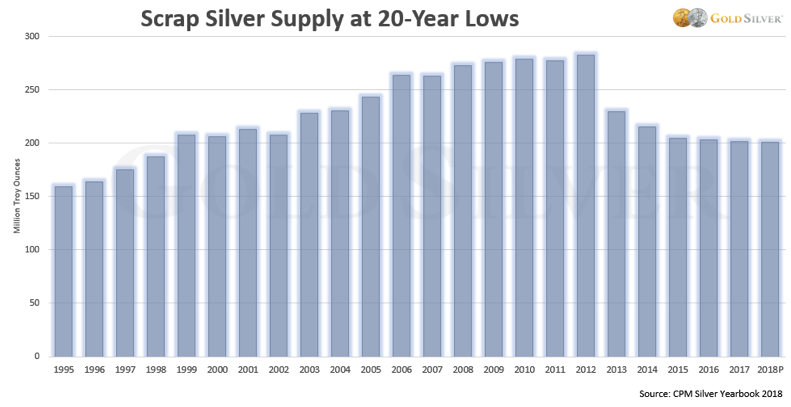 Supply and demand trends are clearly poised to continue tightening the silver market. And when the next crisis hits—regardless of whether Mike Maloney is 100% right about the details or not—and physical investors start buying in droves again, the silver price will be significantly impacted by this trend. It may not happen this year, but the 20,000-foot view of this market says a crunch is on the way. It’s supply/demand 101. The silver price could experience a knee-jerk decline if the stock market crashes similar to its fall in October 2008 (and if silver does decline, it’ll be temporary just like it was in 2008). Absent that, the breakout for silver is only a timing question, not an “if” one. This argues for making sure you have meaningful exposure to silver now, and maybe having a nice “cash stash” in case we do get better prices one last time. However, keep in mind that a drop in the silver price may not actually end up handing you a bargain. Long-time investors will remember what happened to premiums when silver crashed in 2008/09: they soared. So while silver itself was priced significantly lower, investors were forced to pay near the same total cost for coins and bars after the 50% to 90% premiums were added in (yes, we know of a dealer that charged 90% premiums for a short time then). What the Mint charges dealers is currently below average. 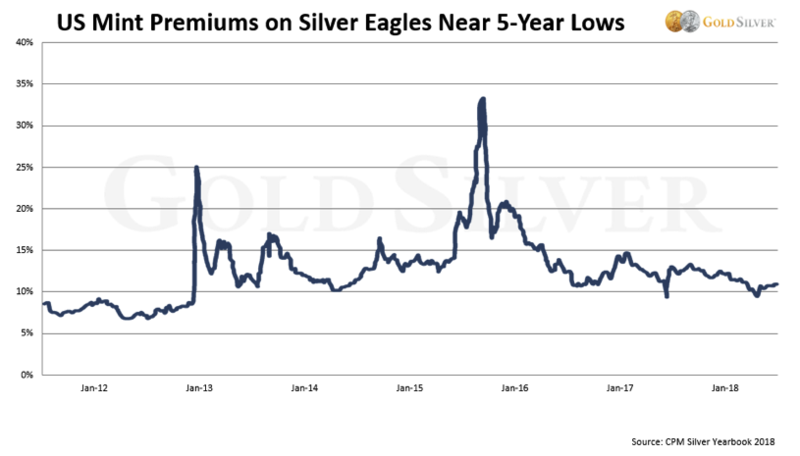 But that will change: you can see that less than two years ago premiums on Silver Eagles hit 33%—and that’s without a crisis! Make no mistake: when the next crisis strikes, especially one of a monetary nature, it’ll be more than just the silver price that soars. Premiums will spike, too. A lot more could be written on the supply/demand topic. But a crunch is clearly building, and while it will wreak havoc on the silver market, it will be very exciting for those of us that own lots of physical metal. Hang on.